Just trying to choose the 5 best scenes almost had me in tears. I made my final agonizing choice of the 5th scene mere moments before posting this article. Everyone has a death scene that moves them - these are my personal picks for scenes that moved me the most, all of which do so because of the actor's performance, the quality of the film, and the music that captures the moment. A Tale of Two Cities (1935). Ronald Colman's incredible performance breathed life into Dickens' tragic hero, Sidney Carton, an intelligent, disillusioned man living a purposeless life. Sydney finds his purpose in sacrificing that life for the love and friends he found too late. He goes to his death on the guillotine at the savage time of the French revolution knowing that he will be cherished in death as he never was in life. "It's a far, far better thing I do than I have ever done. It's a far, far better rest I go to than I have ever known." The Ox-Bow Incident (1943). An unusual western, this is the only truly great movie that had such an effect on me, I cannot watch it over and over as I do with other greats. Henry Fonda plays Gil, a just and caring man. Gil finds himself involved with a vengeful posse which takes the law into its own hands. 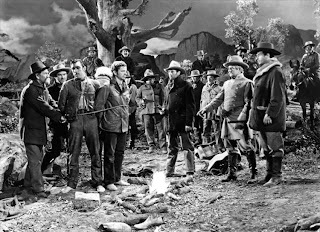 The group of men capture and decide the fate of three innocent men whom they believe to be rustlers, and Gil watches in horror as the posse evolves into a lynch mob. In the final scene, set in a saloon to which the posse has returned, Gil reads aloud a letter written by one of the hanged men (Dana Andrews) to his wife and children. The scene is movie-making at its most powerful. "This is only slightly any of your business my friend." "Hangin' is any man's business that's around!" Titanic (1953). Out of many movies made about the Titanic, this is my favorite. Casting is superb, headed by Clifton Webb and Barbara Stanwyck as Richard and Julia, a wealthy estranged couple, bitterly divided over their lifestyle and that of their children. Strong writing and wonderful actors create a group of memorable characters, including feisty Molly Brown (Thelma Ritter), the Captain who mourns the fate of his ship and passengers (Brian Aherne), an immigrant family saved by Richard, a young defrocked priest (Richard Basehart) who risks his life to save workers below decks, a college student (Robert Wagner) who loves Richard and Julia's daughter. 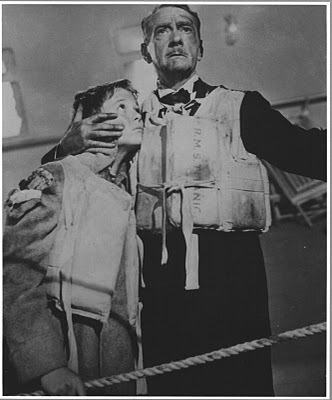 As the ship sinks, Richard's young son Norman climbs out of the lifeboat as it is lowered, and goes to find his father. Julia discovers his absence too late, and is inconsolable. To the tune of "Nearer My God To Thee", Richard and Norman stand together. I'm wearing long trousers now." every day of your life. I feel tall as a mountain." Midnight Cowboy (1969). 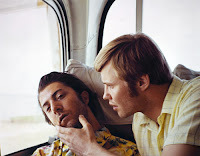 John Voight as Joe Buck and Dustin Hoffman as Ratso Rizzo are two of life's outcasts, one a true country innocent lost in New York, with ambitions of which he has no real understanding, the other a street-wise, lonely and very sick little man invisible to the uncaring crowds around him. They find each other and their need begins a friendship. But Joe's naive idea of seducing rich women and living high is a failure. The men are eventually homeless, cold and hungry. Rizzo has advanced tuberculosis, and his one dream is Florida, where it is always warm and sunny, and his damaged lungs would heal. Desperation and fear for his friend drives Joe to beat a man and steal his money. He and Rizzo, full of hope, board a bus to Florida. But Rizzo doesn't make it. As the bus draws closer to their dream home, Rizzo seems to be sleeping in the seat next to Joe. The bus driver stops and comes to the back of the bus. He sees that Rizzo is not just sick, but has died. He kindly tells Joe that they are close to Miami and will finish the last couple of miles. Joe holds Rizzo close as the bus reaches their promised land. Driver: "Do you want to close his eyes?" One Flew Over The Cuckoo’s Nest. (1975). R.P. McMurphy (brilliantly played by Jack Nicholson) believes acting crazy will get him into a hospital psych ward, which sounds much better than jail. He is crazy, but not insane. He is charming, immoral, in and out of jail for petty crime, and loves to live his life as a free spirit. He finds himself in a ward with neurotic men who voluntarily stay in the hospital. It doesn't take Mac long to stir up the men who are just hiding from the world, encourage them to get out and take life by the throat, live as men. But the ward is run by a cruel, controlling woman, every patient's nightmare, Nurse Ratched (Louise Fletcher). She is determined to break Mac's spirit, and he is equally determined to break her iron grasp. Mac becomes close friends with the Chief, a giant of a man who pretends to be mute and tells no one of his soul-destroyed life, except McMurphy. "What are doing in here, Chief? Huh? What's us two guys doing in this ... place. Let's get out of here. Out." But after Nurse Ratched's cruel treatment causes the suicide of Mac's young friend Billy (Brad Dourif), she finally gets her wish. Enraged, Mac tries to kill her, and is dragged out of the ward. He is gone for weeks, and the men have created a legend about him escaping the bonds and being free. One night, he is brought back to the sleeping ward and put into a bed. The Chief is overjoyed and goes to McMurphy's bed. without me. I was waiting for you. Now we can make it Mac. but Mac's head lolls side to side, his eyes dead, his mind destroyed. The Chief sees the scars of lobotomy on his forehead. "Oh no. I'm not going without you, Mac. I wouldn't leave you this way. then breaks a barred window and runs to freedom. I had runner-up scenes to mention, but I'd rather hear what has moved you in the movies you have seen. Great post! 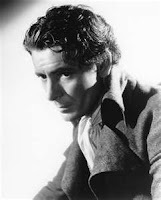 Ronald Colman at the end of "A Tale of Two Cities" is superb; the film a wonderful treatment of Dickens. I love how the camera moves skyward while you hear his (oh so beautiful) voice reciting the final lines. 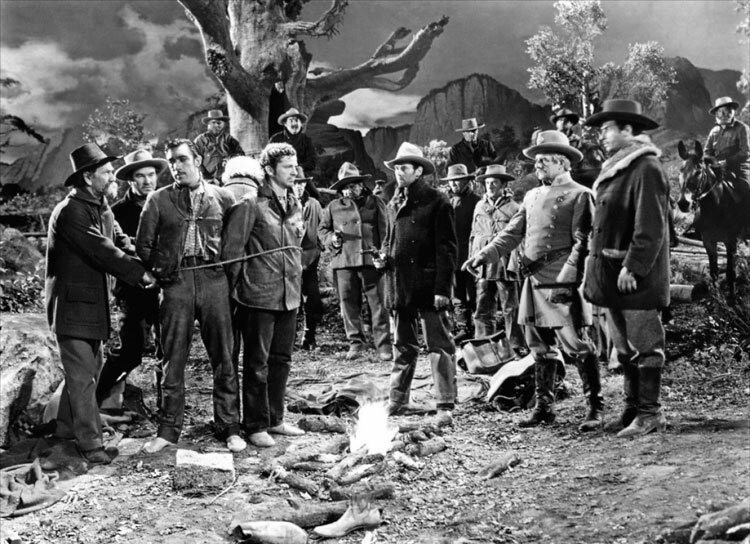 A runner-up scene: Thomas Mitchell's death scene in "Only Angels Have Wings," as he asks his friend Cary Grant to leave so he can face death alone. Just as good is the scene right afterwards, when Grant goes through Mitchell's few remaining possessions, speaking only a few, banal lines of dialogue; it's a scene that could have come straight out of Hemingway. Becky, what a marvelous addition to the Cafe's "Five Best..." series! Of the ones you listed, my favorite has to be Ronald in A TALE OF TWO CITIES. One I would add is Errol Flynn saying farewell to Olivia and then leading his men to certain death in THE CHARGE OF THE LIGHT BRIGADE. There are other memorable death scenes--but they didn't make me cry, such as: DOA, in which the whole film is one extended death scene; Slim Pickens riding the bomb in DR. STRANGELOVE; and Kirk saying farewell to Spock in WRATH OF KHAN (though did Spock really die?). Becky,it certainly was the best of times and the worst of times for Sidney Carton, who was played to perfection by Ronald Colman. 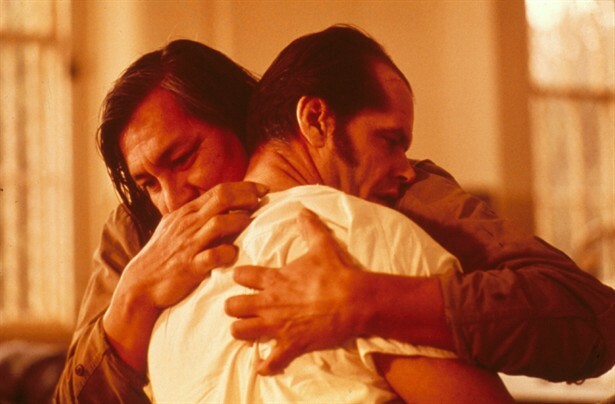 I also teared up watching Chief be the one who escaped the Cuckoo's Nest. Another film I thought of that was quite touching to me was "Spartacus." I enjoy a good cry during movies now and then. This was a special and heartfelt post and I truly enjoyed it. Becky: Glad you included "Titanic" which really impressed me when I saw it recently. That scene between Webb and his son was one for the books. While its a natural death, Gene Tierney's final scenes in "The Ghost and Mrs. Muir" always get to me. Herrmann's music is mostly responsible, but it gets me every time. Becky, when I heard you were doing the 5 best movie death scenes, I didn't realize you were listing ones that made you cry! I was thinking death scenes for villains, you know, ones that you either were anticipating or were almost happy to see. I'm just too cynical. This is a superb and supremely well written list, Becky! I don't cry at many dramas, most often because I can tell a particular character's death is going to happen. When I cry at death scenes in films, it's for films like John Woo's 1989 THE KILLER. I've seen that a few times and have cried at each viewing. Again, great list, and I really liked your pictures and accompanying movie quotes. Personally, I always get super emotional at the end of the 1939 version of Of Mice and Men starring Lon Chaney Jr. and Burgess Meredith. I'm not going to include any spoilers (besides the fact that there is a death), but that scene in the movie made me cry more than the book itself did! I know what you mean about "The Ox-Bow Incident". It's a movie I've been meaning to show my daughter, but even though its scheduled on television this weekend, I don't think I'm up for it. If I made a list, it would have to include Ward Bond in "The Long Voyage Home". GrandOldMovies, I had actually forgotten about Thomas Mitchell's scene, but your comment brought it back and it WAS wonderful. Rick, Kirk saying goodbye to Spock did bring me to tears, and almost made the runnerup list! I'm a closet Trekkie. Toto, Spartacus was heartbreaking -- I love good drama, and don't mind being brought to tears in a great drama. Kevin, Mrs. Muir's death scene is gorgeous and haunting, and you are right, it's mostly because of Bernard Herrmann's fabulous score. Sark, I haven't seen The Killer, but if it made you cry, I need to see it. Thank you so much for your lovely compliments. Emmy, that scene in Of Mice and Men is just remarkable, and certainly in my Top 10. You're right, the movie makes you cry -- it just brings such reality and life to Steinbeck's story. CaftanWoman, I haven't seen The Long Voyage Home! I've got to take care of that. I don't blame you about watching Ox-Bow Incident with your daughter -- it is so hard to watch. What a tribute to the quality and power of that film! Great choices.I teared up just reading your list. Honest. When I read TALE OF TWO CITIES in high school I cried at The Speech even then. Oh, TITANIC with Clifton Webb. GREAT ending. I liked this movie so much better than the James Cameron version. KING KONG - I can't watch the ending even now. Watched THE OX-BOW INCIDENT, don't have the strength to ever watch it again. It's just too cruel. Can't watch LASSIE COME HOME without blubbering. My post is even older, but I had to add Jeanette MacDonald's death in "Maytime". Though it's a happy ending (SPOILERS - you see her ghost reuinted with the ghost of the man she loved), it gets me going every time. "Penny Serenade" also gets me going, though the death is off-screen. I second Ghost and Mrs. Muir and Dark Victory. And I can't even think about Captains Courages without hearing that silly "Little Fish" song and wanting to blubber!